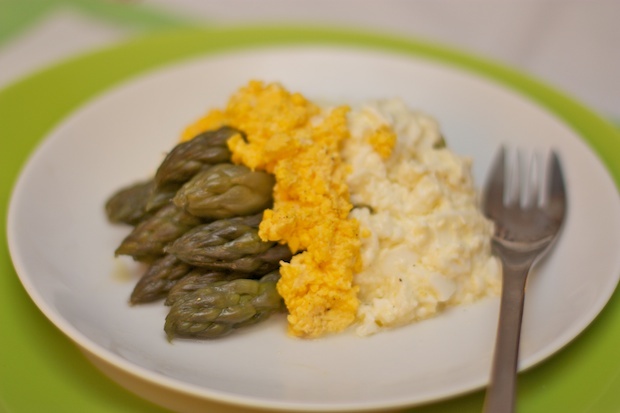 Eggs and asparagus are a classic pairing in Friulian cuisine. Asparagus grows in many agricultural areas of our region and we are famous for asparagus from Tavagnacco, Fossalon, and Gorgo di Latisana. They can be white, green, and violet. From April to late May I like to make this shoot in various ways to satisfy my husband who loves them. Asparagus has been known since ancient times and it seems that their origin is to be placed in sandy lands between the Tigris and the Euphrates. Asparagus should be eaten freshly picked so you can appreciate its quality. If asparagus cooks for hours, it loses it’s liquid and tends to be bitter. For this reason it pays to buy directly from the manufacturers who sell to the public. Like many elements of spring, asparagus is cleansing and facilitates diuresis. This recipe is very simple and can represent either a small starter or a main dish. Everything depends on the quantity. Thoroughly clean the asparagus by cutting off the hard parts and filaments. Bring 1 liter of water to a boil with little salt in a saucepan. When it boils, add the asparagus and simmer over low heat for 15-30 minutes depending on the variety and freshness of the asparagus. When you insert a fork in the stem, it should be tender. When they are cooked, turn off the burner and add a tablespoon of butter and let the asparagus rest in the cooking water until ready to serve. Boil the eggs for 8-10 minutes from when they start to boil. Let them cool. Shell them, separating the yolks from the whites. In a bowl crush the egg yolks with a fork, toss with a little olive oil, 1 tablespoon of mayonnaise, and a little salt and pepper. Mash the egg whites in another bowl, season with olive oil, mayonnaise, mustard, salt and pepper. Place on a serving platter or individual plates, forming a “mountain” with the asparagus, add the egg whites near the bottom and the egg yolks near the tips. Posted in Eggs, Recipes, Vegetables. RSS 2.0 feed.